I've had a bruiser of a day- within 30 minutes of getting up, I let Petunia burn her mouth on oatmeal, causing her to refuse to eat any breakfast. And then about an hour later, she threw up all over me (we think because her tummy was fully of snot from the cold she's getting over and not much else). So there was a lot of laundry to do and a little bit of sofa cleaning, too. Hubby took Pumpkin down to the Children's Museum during Petunia's naptime so that I could get some work done, but Petunia didn't cooperate. We took two walks (at least it was a beautiful day!) before I finally got her down for her nap roughly 30 minutes before it was supposed to be over. I managed to get 40 minutes of work done- just enough to meet the immediate needs, but not enough to get ahead at all. To top it all off, Petunia threw an absolute wobbler at bath time. She didn't want a bath (but she needed one- see the bit about throwing up, above). Then she didn't want out of the bath, but she didn't want to stay in, either. Then she didn't want to go get dressed. Anyway, she's off reading stories and snuggling to sleep with Hubby now, and I am ignoring the fact that Pumpkin and I should be cleaning up her room and am letting her color while I blog, instead. And I'm going to make myself feel better by indulging in a post that will make me smile, but will probably only be interesting to my parents. Hey, its my blog. I can do that. One of the things that has been making me smile these days is my kids' art. I have no illusions that they are budding artistic geniuses, but something about the innocent outlook and straight-forward execution just makes me smile. 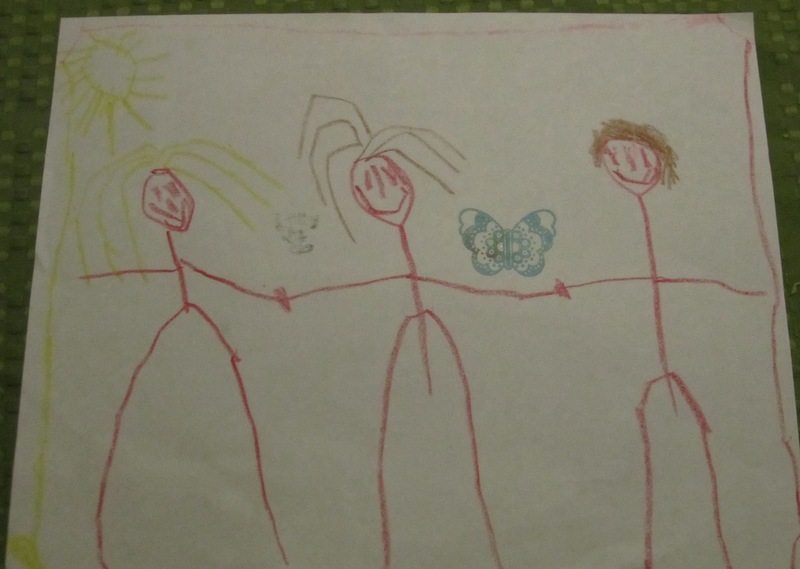 First, a few months ago, Pumpkin drew this picture of herself (on the left) and her "silly friends"- these were the friends she started playing with a lot when she was having trouble with B. at day care (that trouble seems to have passed, thankfully). One is another girl and one is a boy. She and her silly friends liked to run around and do silly things. 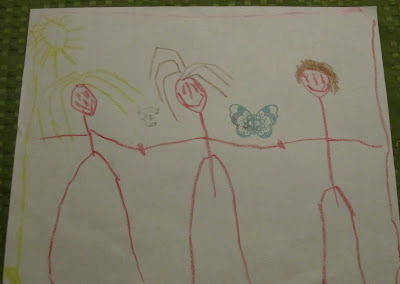 I never really figured out what those things were, but she was happy- and that was nice, after having her come home sad about B.
I had hoped that we would get to keep this one, but she came across it recently, and decided that she wants to give it to the little girl depicted in the middle, whose mom just had twins, so all I'll have is this snapshot. Next, Petunia recently announced that she was going to draw a fishy. And then she did! We're not sure if the fact that she actually drew a fish was an accident or not, but we were still impressed. She drew a fish in exactly the same way that I do. Here is a close up of the fishy. I like to think that this depiction of a small fish in a big, strange, but beautiful sea is a metaphor for the artist herself. She won't confirm that, though. I'm glad you took some mental health time and posted those adorable works of art! Hope Petunia is feeling more like herself! 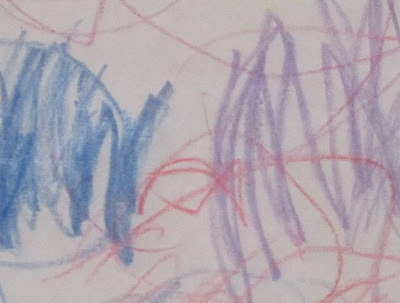 If it makes you feel any better, Anandi, my 5 year old's art looks more like the younger daughter's than the older daughter's but we're all about spatial and not doing too badly on gross motor skills (depending on the time of year and weather). There's only 24 hours in the day, so there's trade-offs. I'd think this was proof for Cloud's point about boys not getting enough arts and crafts... but I think this is more of a parents not being particularly interested or adept in this area and him not having any special desire of his own. The rest of the boys in his class drew much more sophisticated pilgrims and Indians for the Thanksgiving program, even the younger ones. I think MY drawing looks more like Petunia's than Pumpkin's.... Petunia has been asking us to draw fishies for her, and I am not joking- my fishes look just like what she drew. 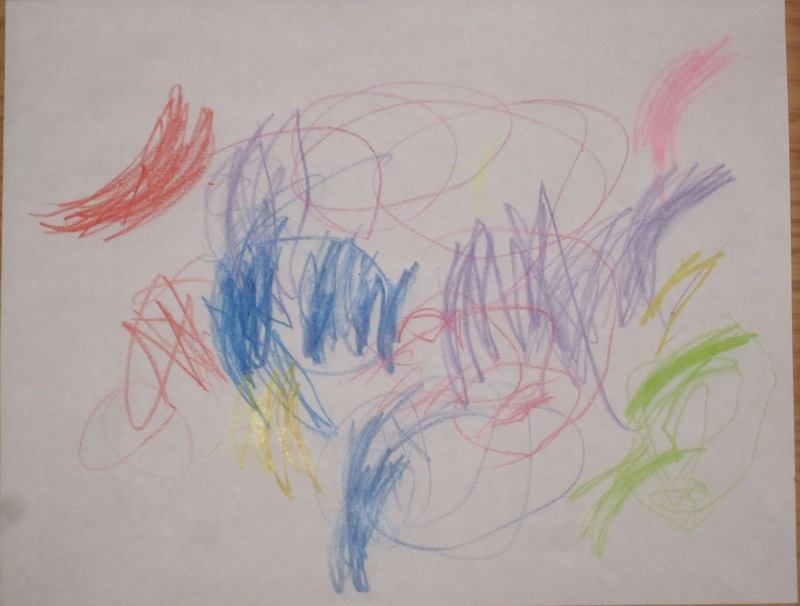 Kids' art is always such a good pick me up. I love seeing how their perspective and abilities change as they age. It really is a window on their world and I love getting that glimpse. We've been neglecting arts & crafts around here lately. A&C are not DS' teachers' strong points, so I've decided to make more of an effort to do stuff with DS on the weekends and even some weeknights when we can squeeze it in. Just have to remind myself that it doesn't always have to be a big Project, with a capital P. Sometimes 10-15 minutes is all that it takes. And as mentioned above we're trying to find the balance with some gross motor winter fun. Not easy to find the balance, but let's just call it a work in progress. I think the extra A&C is paying off as he's been coming up with ideas of art to do himself "Mama, let's make some macaroni art. Do we have any arts & crafts macaroni?". Or gasp, even going to do something by himself. We may be on to something here.